Turmeric (botanical name Curcuma longa) is that yellow spice that adds a bit of tang to your cuisine. If Indian curry is your favorite thing and you loved the taste, turmeric played a big part of making that happen. But turmeric is so much more than just a seasoning for your lunch and dinner. It has several health benefits when consumed in the right quantities. Let’s look at 5 properties that make turmeric a bit of a medical marvel. Turmeric is rich in curcumin, a naturally-occurring chemical compound that plays a big role in giving turmeric its characteristic yellow color. Medical research has revealed that curcumin actually blocks an enzyme that is related to the growth of head and neck cancer. A research team worked with 21 head and neck cancer patients, who were given two 1000-milligram tablets of curcumin. The tablets were found to inhibit the spread of the enzyme in the patients’ mouths. In 2008, a study was published that listed the many beneficial properties of curcumin, which help it combat Alzheimer’s disease. The study concluded that the compound holds great potential in th treatment of Alzheimer’s disease. A point that was noted in the study is the fact that Indian food is rich in turmeric, and therefore in curcumin. The study hypothesizes that this factor might explain why Alzheimer’s among people aged between 70 and 79 years is 4.4 times less prevalent in India than it is in the United States of America. Isha Foundation lists a turmeric-based mixture that prevents phlegm as one of the health benefits of turmeric. If having a blocked nostril is a common problem for you, or you go down with colds too often, this might be the right brew for you! Take 10 pepper corns and roughly crush them. Soak them overnight in two spoons of honey mixed with turmeric. Take this mixture in the morning and be sure to chew properly on the crushed pepper. This should help bring down the amount of phlegm in the body. Researchers from an Italian University found that patients suffering from osteoarthritis who consume a special formulation of turmeric (prepared by the research team) for 90 days, reported 58% less pain and stiffness. The patients were able to reduce their dependence on painkillers by 63%. 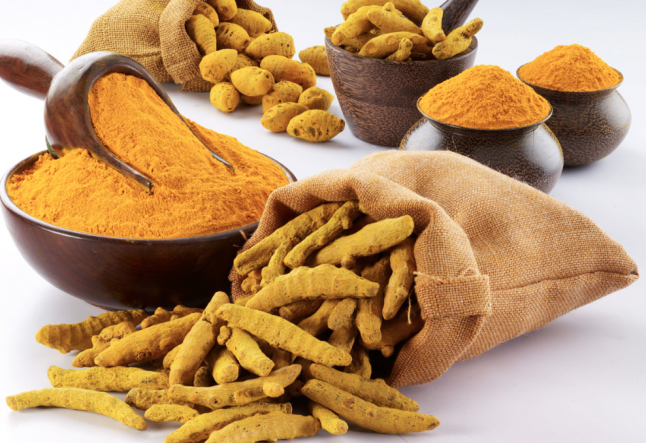 A compilation survey of research efforts on the health benefits of turmeric was published, which refers to turmeric as solid gold because of its antioxidant, anti-inflammatory, antiviral, antibacterial, antifungal, and anticancer properties. Turmeric is therefore helpful in dealing with various diseases such as diabetes, allergies, arthritis, Alzheimer's disease, and other chronic illnesses. Curcumin is therefore something of an ideal spice for life! Various kinds of extracts of curcumin are available in the market today. However, consumption of curcumin as an isolate is preferable only in cases of specific health issues or illnesses. For general health, curcumin is best consumed in the form of turmeric, as nature provides it. Besides, turmeric makes food taste and look great too!